You are one busy girl! Love this look! Have fun on your trip. Lovely combination: a long skirt and a stripe t-shirt! You are so busy! It's a wonder you have time to blog! Have fun!! Love the maxi! I love the casual side tie on that top--so cute! Have a great trip! Wow, Bogata! Have fun! I like the quote, too. Have a ton of fun! Jealous of your travels :) That skirt is so long and has great draping/movement, I can tell. Really cute styled casual with the striped top. lovely post, and u look adorable! What a pretty maxi skirt! Love it! Give a look to my blog! If you we can follow each other! Love how the skirt does not look like a dress at all. Hey dear, have a lovely trip. super sweet outfit, I like the stripes. Your hair looks amazing! love the skirt!! or should I say dress! Great outfit! I love how casual and comfortable it is, yet very well put together! Love everything about this from the hair to the knotted shirt! This is such a gorgeous look, and so are you! 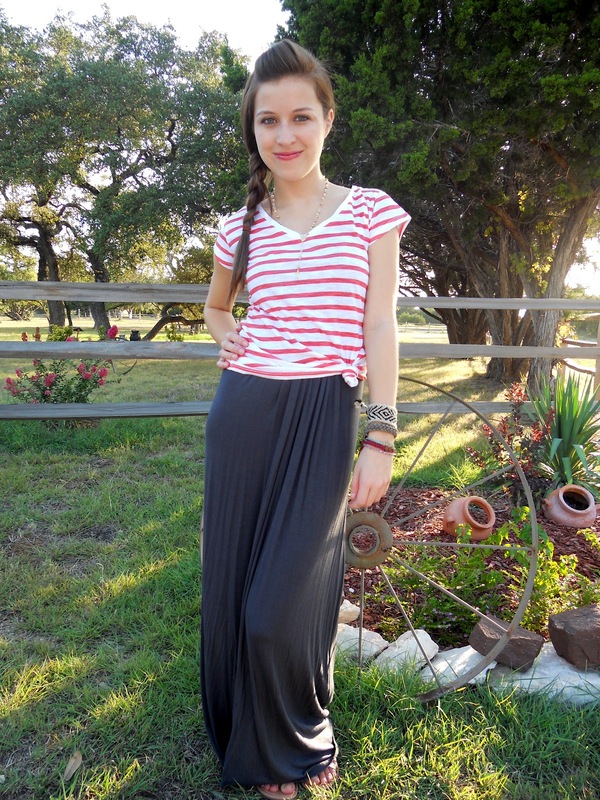 Really loving how you paired a casual Where's Waldo striped top with that awesome pleated maxi skirt! Truth be told, although my hemlines tend to be on the shorter side, I've been dying to try a maxi skirt as of late, even though I've avoided anything that goes past the knee because of how short I am. Haha. Fantastic look and I'm having some serious hair envy here! Love this! You look so polished yet effortless! It's great. Such a fun outfit! I love your braided hair too :) Have an awesome time in Bogota, it sounds like it's going to be a good trip. can you believe Ive never seen that movie? I know! Cute outfit though! What an exciting weekend, have fun in Bogota!! I love your maxi skirt and stripes combo, it's one of my favorite combos too! This outfit looks so cute...but comfy too! LOVE LOVE LOVE this maxi skirt! Looks FAB! You're so pretty! i love your dress! Gorgeous!! Now following your blog, it's amazing.